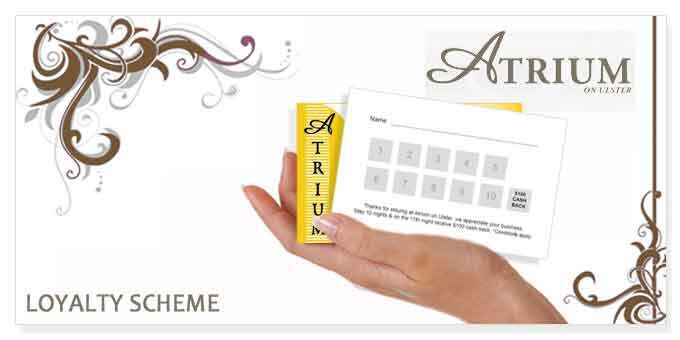 At Atrium On Ulster we operate a loyalty a scheme to show our appreciation of your custom and to reward regular bookings from our guests. For each night’s stay you will receive an authorised stamp on your loyalty card. Stay 10 nights within one year and on the 11th night receive $100 cash back. *Please Note Terms & conditions apply: Loyalty scheme offer applies to bookings made direct via our own website or directly by phone on 0508 287486. Offer is not applicable to bookings made through discounted sites or third parties, please enquire for further information on our scheme.